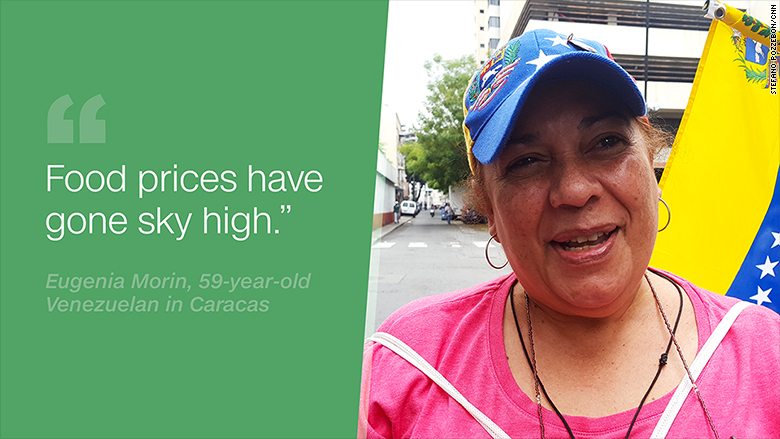 Mariana Mejias can't afford to buy a bag of rice in Venezuela. She lives in Mariche, an extremely poor neighborhood in the country's capital, Caracas, which suffers from severe food and medical shortages like the rest of the country. If the government doesn't provide a subsidized monthly bag of food, Mejias would go hungry. Skyrocketing prices have made food at her local market prohibitive. The monthly food bag, worth 10,000 bolivares ($2.25), includes rice, milk, pasta, beans and a few other items. A bag of rice at Mejias' local store goes for 8,000 bolivares -- out of reach for her monthly income of 219,000 bolivares or $49 on the unofficial but often used exchange rate calculated by dolartoday.com. "Things are horrible here, I don't know how people are even surviving," says Mejias, a 62-year-old house cleaner who earns minimum wage plus a government pension. Venezuela's socialist government, led by President Nicolas Maduro, raised the minimum wage 60% on Sunday to 200,021 bolivares ($45) a month, including food stamps. But that won't buy much at the supermarket. 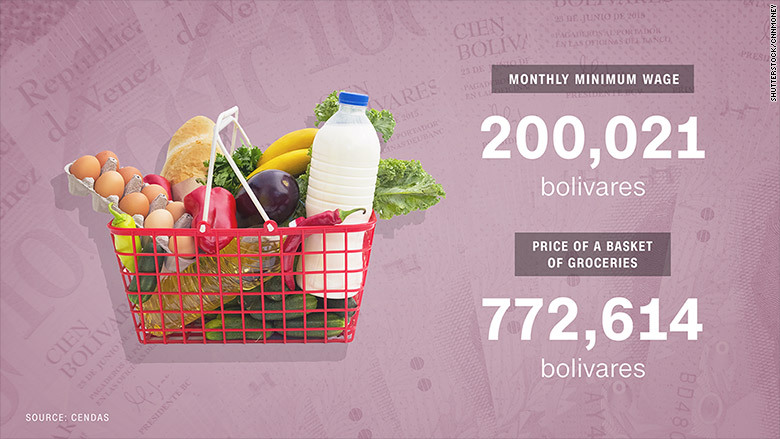 In March, a basket of basic grocery items -- including eggs, milk and fruit -- cost 772,614 bolivares, or close to four times the monthly minimum wage, according to the Venezuela-based Center of Social Analysis and Documentation, or CENDAS in the Spanish acronym. Food shortages and soaring prices have led to troubling results. Last year, the average Venezuelan living in extreme poverty lost about 19 pounds due to the lack of food. Many of its citizens had to skip meals, according to a national poll. 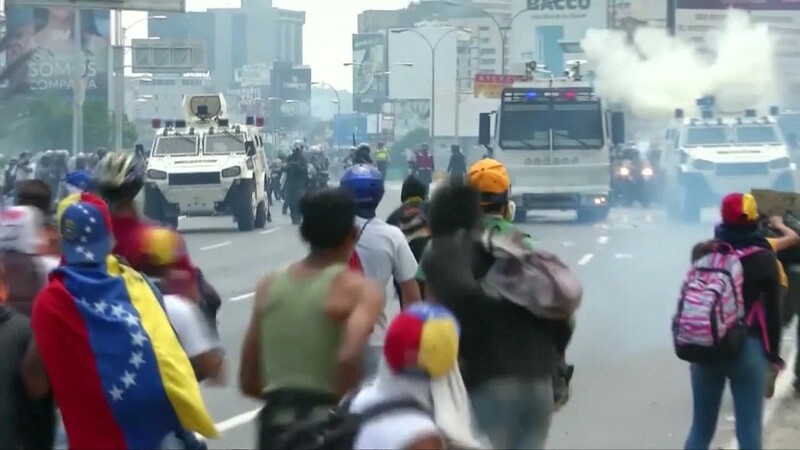 The food crisis is worsening as Venezuela dives deeper into chaos. On Monday, Maduro issued a decree that may allow his party to rewrite the country's constitution more to its liking. On Tuesday, Maduro suspended Venezeulans' right to carry firearms as weeks of anti-government protests stretch into the spring. Amid the political chaos, food price hikes are staggering. 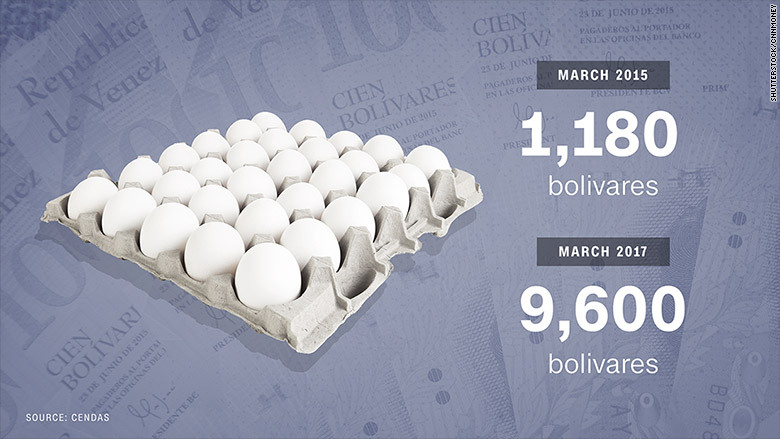 A carton of 30 eggs cost 9,600 bolivares in March, up from 1,180 bolivares in March 2015, CENDAS reports. "Food prices have gone sky high and the minimum wage is not enough for basic needs," says Eugenia Morin, 59, who describes herself as a middle-class housewife. She protested against Maduro on Tuesday. While the 60% minimum wage hike may sound significant, inflation is expected to rise 720% this year and over 2,000% next year, according to the IMF. One bolivar is worth less than one cent. Prices for basics are skyrocketing each month. Compared to February, prices in March for milk and cheese rose 33%, meat 19%, fish 17% and fruits 14%. Even mayonnaise cost 11% more. That's only the beginning. For toiletries the increases are even worse. Deodorant prices shot up 93% in March from February; detergent 62%; shaving razors 53%; toilet paper 27%. Venezuelans either face food and toiletry shortages at supermarkets with empty shelves -- or skyrocketing prices for whatever items are available. Medical shortages also illustrate the country's humanitarian crisis. "If you need to have an operation, nowadays, you must bring your own medicines to the hospital," adds Morin, the housewife. "There are no supplies to attend the most basic emergencies." Food shortages are the result of the government's long running policies. It focused on exporting oil and largely abandoned its abundant farmland. The government started importing the vast majority of food for its citizens. But even when oil prices were high, that policy was barely sustainable -- food shortages starting popping up when oil was worth over $100 a barrel. But with oil now hovering around $50 a barrel, Maduro's administration can't afford to import enough food and also pay down its debts to foreign creditors. For now, it's prioritized debt payments over shipping in food. That end result: rising hunger and no visibility of where the next meal will come from. One Venezuelan spent hours on Tuesday morning in Caracas waiting for a grocery store to open, hoping to buy food. The 60-year old man, who declined to give his name, wasn't hopeful he'd be able to buy food. "Nobody knows what's going to arrive or what we could find inside. So we queue almost every day of the week, losing time and working hours to look for food," he said.